Paul Ryan elected speaker of the house in foregone conclusion, now comes the hard part. 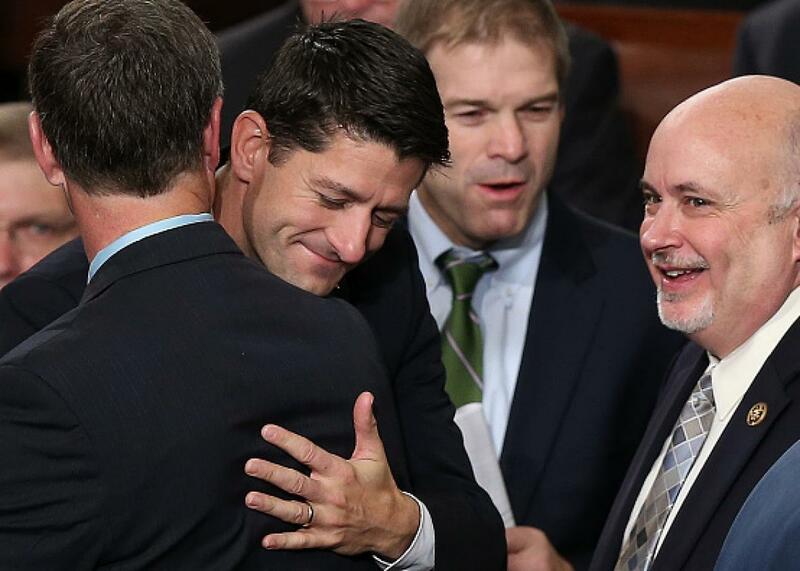 Paul Ryan was literally and figuratively embraced by his colleagues as he was about to be voted in as speaker. Paul Ryan was elected as the 62nd speaker of the U.S. House of Representatives on Thursday after receiving overwhelming support from the Republican caucus to win the office with 236 votes. Former speaker and current House Democratic Leader Nancy Pelosi had 184 votes. Ryan takes over for John Boehner, who brought out tissues in his farewell speech in a nod to his famous propensity for tears. He didn’t appear to cry during the speech (though he reached for the tissues to continue the gag). But he did issue a call of praise for his successor, pointing to the fact that Ryan was essentially conscripted for the job after the previous candidate, Rep. Kevin McCarthy, had his bid done in by the same House Freedom Caucus that pressed Boehner into resigning last month. Ryan was the 2012 Republican nominee for the vice presidency and the outgoing chairman of the House Ways and Means Committee. Mitt Romney, who selected Ryan as his running mate in the last presidential election, was in the gallery with his wife, Ann, at the invitation of the new speaker. The election bring some closure to a tumultuous month for the House of Representatives and comes on the heels of Boehner “cleaning out the barn” for Ryan by helping to pass a bipartisan two-year deal to fund the government and raise the debt limit on Wednesday night. Boehner resigned when a renegade group of conservatives known as the House Freedom Caucus promised to challenge his speakership. They then torpedoed Boehner’s initial succor, McCarthy, for not being conservative enough after the California representative described the Benghazi committee as a successful political attack on Hillary Clinton. Despite serious antagonism from the right-wing media to Ryan’s speakership bid—which he kicked off with a series of demands that he eventually backed down from—a “supermajority” of the about 40-member Freedom Caucus eventually supported Ryan. Though that was good enough to easily put Ryan in the speaker’s chair, there were still more than a handful of straggling anti-Ryan votes, with nine members of the House Republican caucus voting against his bid. Rep. Daniel Webster of Florida, a member of the Freedom Caucus who continued his bid after Ryan won the nomination of the Republican caucus, received those votes. Three Democratic members decided to vote for someone other than Pelosi, with Rep. Kyrsten Sinema voting for civil rights icon Rep. John Lewis, Rep. Jim Cooper of Tennessee voting for “General Colin Powell,” and Rep. Gwen Graham of Florida voting for Cooper.